Using Domestic Geoarbitrage to Retire Sooner - Can I Retire Yet? Geoarbitrage is a concept popularized by Tim Ferriss in his book “The 4-Hour Workweek.” Geoarbitrage sounds complex, but the principle is easy to understand and apply. Different geographic areas have different costs of living. Geoarbitrage is simply taking advantage of these differences. This can be a powerful tool during your wealth building years, and it can make your money go further in retirement. Ferriss wrote of global geoarbitrage enabling mini-retirements in places like Argentina, Panama, or Thailand. Quality of life is high and cost of living is low in these places compared to the United States. There are many globetrotters in the financial independence, retire early (FIRE) community who are utilizing geoarbitrage to experience lives full of adventure and world travel. Retire Early Lifestyle, Go Curry Cracker, and Millennial Revolution are popular blogs built around the stories of early retirees traveling the world. You may find these stories interesting, but desire a more traditional lifestyle. You can still utilize geoarbitrage. Within your country, state, and city are opportunities for domestic geoarbitrage. As we plan our upcoming cross country move, I realized this had been one of the most powerful and practical tools enabling my early retirement. A quick web search will reveal many articles comparing cost of living in different cities and states. It’s easy to think of cost of living in terms of cost of housing. Others focus on reducing taxes. Geoarbitrage is most impactful when starting with your wants and needs to build an individualized plan. The process starts by identifying what stage of life you’re in and determining what you want your life to look like. Where do you want and need to spend your time? What people and activities are most important to you? The second thing you need to know is how much money you’re currently spending. Many people don’t take the time to budget or track their spending. It’s difficult to improve, and impossible to quantify improvements without a baseline reference point. Finally, it’s important to realize that situations change over time. Geoarbitrage is a concept that can be customized to meet your needs through different stages in life. Several key factors can be influenced with geoarbitrage. I’ll highlight them and demonstrate how they’ve accelerated my path to retirement while improving quality of life. It’s not a secret that housing costs vary greatly in different locations. According to Kiplinger, median house prices in the hundred largest metro areas range from a low of $75,000 in Youngstown, OH to a high of $1,000,000 in San Jose, CA. These massive differences in housing prices equate to massive differences in the ability to save during your working years. We started our professional lives in Pittsburgh, PA, the eighth least expensive city on the Kiplinger list. We then moved to our hometown about two hours outside Pittsburgh, where housing costs are even lower. While saving for early retirement, we lived in a 2,200 square foot new construction. We paid off our mortgage in only seven years, enabling us to build equity with plenty left to invest. This would have been impossible without sacrificing lifestyle if we lived in a more expensive area. Housing costs were also a point of emphasis when considering our retirement location. We were committed to living close to our favorite outdoor activities, particularly skiing. Ski towns are notoriously expensive. This quickly narrowed our national search. On the local level, we considered Ogden and Salt Lake City (SLC), Utah. These cities are about an hour apart, with similar features that attracted us. The median home price in Ogden is $211,000 compared to $301,000 in SLC. The house we ultimately chose in Ogden enabled us to buy more house, have better outdoor access with less crowds, and pay far less than would have been possible in SLC. Geoarbitrage is typically thought of as a way to lower your cost of living, making money go further. Geoarbitrage becomes especially powerful if you can simultaneously earn more. Our examples demonstrate how this can work. I went to college at the University of Pittsburgh and fell in love with the city. That love wore off when I realized the glut of physical therapists in the city meant starting salaries were well below the national average. After starting my career near Pittsburgh, I was able to substantially increase my income by moving away from the city, where supply and demand shifted in my favor. By moving to my hometown, I nearly doubled my salary in just two years. The low supply and high demand for health care providers in rural areas creates excellent opportunity for workers in the medical field willing to go where they’re needed. There’s also great opportunity for those who work remotely to utilize geoarbitrage. According to the Bureau of Labor Statistics, 24% of working people do at least some of their work from home. The trend of more people working from home continues to grow. My wife falls into this category. When we decided to move to our hometown, her employer was faced with the decision of accommodating her or losing her services. She was allowed to work from home. She later found her current company, based in the Washington D.C. area, that allows employees to live and work anywhere in the country. Working for big city firms, with commensurate salary, while living and spending your money in lower cost areas is another excellent arbitrage opportunity to make those dollars go further. Taxes are a hot button political issue. The reality is your single vote at the ballot box will have little to no impact on your tax bill. However, if you vote with your feet, you can greatly affect your tax burden. There are state and local income tax, property tax, and sales tax. The key is to determine what taxes most affect you and choose a location accordingly. Someone earlier in their careers may benefit by locating somewhere with low income taxes, while income tax is less concern for a retiree. If you value a large home, property taxes will be important, while they are a lesser concern for those looking to downsize in retirement. When deciding where to live during our careers, we used geoarbitrage at the most local level. Homes on one side of our town have lower selling prices but much higher taxes. Homes on the other side of town have significantly higher prices and lower taxes. Annual costs are roughly the same to rent or buy in either location, after factoring both price and tax. We chose to move to the area with lower taxes. Many homebuyers look only at monthly housing payments without considering where their money goes. Choosing a higher housing price meant more of our payment was applied to building our net worth, while choosing higher taxes would have meant that money going to the government. Utilizing geoarbitrage at this micro level, moving only a few miles, meant a difference of thousands of dollars in net worth every year. For those with young children, childcare can be a massive expense. Living in a low cost area can provide access to quality low-cost child care. Moving closer to family can also help defray costs. We were originally planning to move west when we found out my wife was pregnant. Staying close to family enabled us to utilize my parents during our daughter’s formative years. This saved us substantial money while creating a close bond between them. We also have high quality daycare and preschool options in our area. We love her preschool and are completely satisfied with it. This factored into the timing of our move, waiting until she’s ready to transition to kindergarten next fall. As children get older, their education is a major expense. Living in an area with quality public schools can save thousands of dollars each year compared to sending a child to private schools. Saving for college is another expense that can conflict with saving for retirement. Some states are far more expensive than others. Looking at potential expenses down the road, moving from Pennsylvania to Utah takes us from the state with the third highest in-state tuition to the state with the fourth lowest. When determining where to live, it makes sense to focus on where you will be spending most of your time. During your career, that unfortunately means work. It makes sense to choose a location that allows you to maximize the difference between earning and spending. At a local level, living close to your work can save you substantial money and time on commuting costs. Cutting my commute in half was another benefit of moving away from the city early in my career. Compounded over a decade, saving this money and time substantially improved my net worth, health, and happiness. In retirement, your daily activities will have a different focus. Proximity to activities you’ll do regularly can save substantial traveling costs while improving quality of life. Domestic geoarbitrage is one of the most powerful tools you have available to save for retirement. It can also drastically change the equation in retirement, enabling your money to go further. Geoarbitrage enabled my early retirement, and it will allow us to live better for less in retirement. Domestic geoarbitrage is powerful and practical, but it requires thought and effort to choose the location that makes most sense for you. Step back and look at the big picture when considering all the factors affecting your decision. Then get moving. I would say the US is great for geoarbitage. However generally areas are cheap or expensive for a reason, the opportunity or otherwise for well paid work. Also many poorer countries can be surprisingly expensive vs US. Argentina is a good example. Cheap 15 years ago but not now. More expensive than most of the US now. The opportunities for international geoarbitrage are shrinking all the time as living standards and wages catch up with the West. Even Southeast Asia is a lot more expensive than 20 years or even 10 years ago. Thanks for the feedback Tim. I know plenty of people still using international geoarbitrage, but I’m certainly not an expert. I find it interesting in theory, but not a strategy I’d personally be interested in. Agree US has great opportunities that have worked tremendously well for us to help wealth building, and anticipate they’ll continue to be beneficial in retirement. Can someone shed light on Las Vegas? I see so many comments – good & bad — on various web-sites. I realize that it’s hotter than blazes in the summer. But what about health care – crime, etc! Thanks. Las Vegas covers the whole gambit. Yes it can be affordable, but there are several neighborhoods that are affordable but undesirable. There are myriad recreational opportunities (mountains, deserts, river/lake) but it is unreasonably hot in the summer. Good research can find reasonably priced homes in low crime areas. Last year, my wife and I moved from Orange County, CA to Summerlin. We love it. We had to find a place that was cheaper to live. Cost of living and taxes are too high in CA. With no state income tax, we actually got a raise when we crossed the CA/Nevada border As far as I’m concerned, Henderson and Summerlin are the only places to live in Las Vegas. We were also concerned about the summer heat as in July and August the temperature on most days is in the triple digits. As a result, we do our physical activities in the morning and stay inside during the early afternoon. Sometimes, to get away from the heat, we will get away for a couple of days in Orange County or LA which are 4 hours away by car or 1 hour away by plane. You should definitely visit LV in the July/August before committing yourself to the area. We live in Northern Nevada and visit family in the LV from time to time. Nevada is a large state and the difference between north and south is like two different planets. Couldn’t agree more! This is exactly what we did 3 years ago: Moved from Manhattan to Seattle and cut our time to retirement in half. We increased our salaries, cut our housing costs in half and went from one of the highest state and city tax areas to a state with no income tax. No regrets at all. It’s interesting how big an impact geoarbitrage can have. Seattle is far from cheap and still cut retirement time in half. Very cool and shows that you need to run your individual numbers. Thanks everyone! I plan on going to LV in mid-August to check out the heat. Does anyone have a feed-back on the health care & doctors? This is great information Chris. I think this is a very important concept that many people overlook. Although I never really thought of it as geographical arbitrage on a micro level, my wife and I did just that to put ourselves in a financially better place. When my wife and I met, we both had our own homes approximately 12 miles apart. I owned a larger home with a good sized mortgage, taxes and plenty of maintenance. She owned a practically paid off small townhome with lower taxes and little maintenance. As we discussed where we would reside, I’ll never forget that light bulb moment when I actually ran the numbers. The choice to make the move from my home into my wife’s home was, hands down, the biggest factor that allowed us to reach financial Independence. Our significantly deceased living expenses due to the move provided opportunity to start saving and investing heavily. There are, of course, other smaller factors that contributed, (two salaries, not feeling a need to keep up with the Joneses, etc) but nothing as impactful as the choice to downsize. Now, we take trips from time to time to places that look interesting to us as possible moves. Who knows, we may stay put indefinitely, as our current situation isn’t so bad. However, we are pretty excited by the freedom and opportunities that financial Independence has opened up for us. Maybe we will eventually find our own little low cost of living Utopia. Thanks for sharing your story. Obviously I agree that this concept is a complete game changer. My argument for international geo arbitrage is healthcare. Optimizing our tax free income by converting IRA to Roth and generating capital gains to increase our base when possible pushes our income above the cutoff for ACA subsidies. Losing those subsidies would add some $25k of after tax money to our living expenses, thereby essentially wiping out a big chunk of our retirement tax strategy. That $25k is more than a full year of geo-arbitrage costs in many countries. Moving to Utah unfortunately does not solve that problem. How are you getting around the health insurance cost issue? For now, my wife continues to get coverage for her family through her job. Without that we would either do whatever possible to keep recognized income low to utilize ACA subsidies or use a health sharing ministries. I don’t love either option, but I think that’s the best we’ve got. Agree that medical tourism is the one factor that would make me consider international geoarbitrage. Are you already living abroad? If so, I’d love to hear more about your experiences, specifically as they relate to health insurance. Thanks for the reply. We have ACA subsidies for 2018 and have to stay in the US for a variety of reasons. However, we are exploring destinations for slow travel in 2019. My goal is to leave the US for over 6 months so that I can buy expat insurance that covers us both inside and outside the US. To qualify for this you have to live overseas at least 6 months out of the calendar year. This became possible since the individual mandate will no longer be required. In theory, to avoid the ACA requirements you have to live overseas for 330 days in a period of 365 days (not necessarily a calendar year). But with the factual disappearance of the mandate, this is no longer an issue. As an aside, be sure to buy expat insurance that covers you inside and outside the US. This type of insurance exists but is harder to find. I forgot to mention that, ironically, I would buy the expat insurance essentially for within the US. Outside of the US, it is possible to self-insure and forget about insurance altogether. But given the low cost of these policies (typically $500-1,000 per year for a couple for a high deductible plan), it would make no sense not to purchase it, since you need it for whenever you visit the US. Thanks for the detailed reply. I hear from a number of readers who can’t/won’t retire in the states b/c of health insurance costs and uncertainty. May be a topic I need to cover in more detail in the future. You make some good points that resonate with me. Particularly regarding moving away from family as we’re leaving our family in PA to move to UT. The key for me is that you’re absolutely right that money should not be the primary motivator and some things are more important. However, we can also get caught in our own limiting beliefs. For example, I’m retired and my wife has a ton of freedom in her work. Our current home town does not offer access to the things we want to do on a daily basis in the outdoors. While our family is here, most of them are not retired or retiring, so they are busy living their own lives. We can’t control that, so we’re going to live where we can have access to activities we love and a community of likeminded people on a daily basis. We’ve also built into our lives the ability to have people who do have the time, primarily my parents and a few friends who are in a similar situation to us, come stay with us for extended periods of time. This is b/c geoarbitrage allowed us to find affordable housing in Ogden with a mother-in-law suite where we can host people. We also planned to have the freedom and means to travel when others are available over holidays and in summer. This again is in part enabled by our relatively low cost of living. No location can give you everything, but you can use geoarbitrage as part of a plan to get the most important things to you individually. I also felt it was important to point out that this principle can be applied at a more local level, with some benefits available by moving just a few miles. Chris-Good post. I think the concept of “Domestic” Geoarbitrage is a very practical way to view financial life options. ‘Geographic arbitrage’ is an intersesting (and fancy) way to describe the concept of simply making financially advantageous life decisions and, (here’s perhaps the more personally difficult bit for many folks) a willingness to move to obtain that financial advantage. While ‘international’ geo arbitrage has been all the rage in the media, I think the concept of ‘domestic’ geoarbitrage is possible for more people and is systematic way to evaluate opportunities to live in different places in the US. And, interestingly, now is a time when US workers are less mobile than in the past 40 yrs, with this being particularly true about millennials. So, for those workers who are capable & willing to relocate to gain financial advantage, now could be a good time to do so and have less competition. Thanks Mark. Agree this is just a fancy word for a common sense solution, which is why I tried to point out how we’ve applied it down to the local level. This concept is better suited for empty nesters. If you have kids in school, you typically pay more for housing to stay in a good school district. You also tend to stay in the same city as moving to a lower cost area for a new, higher paying career is difficult on other members of the family. if your spouse is also working, there is that potential loss of income too. Plus, the more expensive cities tend to have more job opportunities and better pay … likely the reason you’re there in the first place. Certainly this is only one tool, but it is a powerful one with many applications. To the example of high paying jobs in high paying cities, see the example in the comments above of Semira who reports cutting time to retirement in half by moving to Seatlle, not exactly rural America, b/c cost of housing and taxes were dramatically lower than her previous residence in Manhattan. Everything is relative and specific to your situation. With regards to kids and family, there are positives and negatives to any decision. 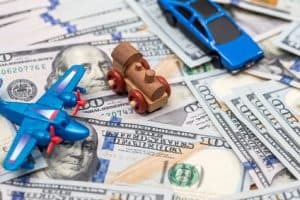 Money should not be the sole driving force, but you should also not underestimate the potential positive effects improving finances can have on your family/children. When I was working full-time, my daughter was raised primarily by daycare. I’d pick her up at 5:30 every day. We’d all be exhausted, feed her, shower her and put her to bed with little time together most days of the week, waiting for the weekend to come (when we also had to catch up on other things we couldn’t get done during a busy week). Now we regularly spend far more time building our relationships. For example, yesterday on a Monday, my wife and I picked her up after preschool at noon, spent a whole afternoon together out skiing and still were home, showered and eating dinner as a family at 5:30 with the whole evening ahead of us to play. It’s quite a difference, and if you have a tool that can free you financially it may be worth some other trade-offs. Just something to think about. Hi Chris. I hear you on the daycare thing. My wife dropped to part time (she’s a physician assistant so she can acutally find good part time work with flexible hours) so we stopped doing the daycare thing. It’s greatly increased the family quality of life but significantly reduced our household income. But we’re still tracking to retire soon. In a few more years, we’re planning to do something similar to you whereas I’m going to retire and she will find a new part time job with health benefits. We plan to travel the world as much as we can. Five year to go! Good for you finding that balance. Not sure what you do or your state income tax situation, but the nice thing about cutting back with a two income household is you shave off some of your most heavily taxed dollars, so cutting hours by say 25% may mean only 10-15% decrease in income. That may still slow down time to retire, but improved quality of life can make that well worthwhile. That is understandable and it underscores the benefit of becoming financially independent ASAP. I know of several financial bloggers who moved to Spanish speaking countries after being FI for the purpose of their children. They enroll their kids in a local school so that they become completely fluent in Spanish. They seem very pleased with the schools their kids are in. Fluency in Spanish may very well help these kids along in their future than being in a “good” school district domestically. It is not for everyone but it sure sounds enticing to me. Yes! Not sure if you are familiar with Chad “Coach” Carson, but he is a friend of mine and currently doing this for a year+ in Ecuador with his wife and 2 young daughters. Not something for me at this stage in life, but may be down the line. Would be much more interested in a shorter stint, possibly a summer. Yes, in our situation, we’ve determined it’s better to keep our higher paying jobs in more expensive Seatle (this includes the safety of being able to more easily find another job if either of us gets laid off) vs moving to a lower cost area with less opportunities. Once our kid is in college, geoarbitrage is much more doable for us. For me in the central US I’m looking at 3 hours south of where I live. An old up and coming old mining area slowly getting discovered. Money left over from the sale of my current house invested at a modest 4% will end up saving me $700 each month over living in the big metro area. Investment income, lower property taxes, and lower cost of housing all contribute. Two hours outside Houston property taxes are easily $7,000 less annually, but a coastal county means windstorm insurance is $4,000 more than in Houston. if you have no mortgage you can self-insure wind, but that’s risky. (Flood insurance, if protected by a levee, is amazingly cheap). Water fees and electric rates can all vary substantially in just a few miles. Definitely many financial factors to consider as well as desired lifestyle. Best wishes on your decision. Hope you have researched the winter inversion. December-February some of the worst air quality in the nation. Loved living in SLC, but three months of haze and smog every year grew tiresome. Also, below Harrison Street, Ogden has some really spotty neighborhoods. Nicer homes in better school areas are similar in cost to SLC. Ogden has a great marathon and Snow Basin is terrific; otherwise far fewer options than SLC. Thanks for the feedback. Aware of the inversions. Definitely one of the downsides of Ogden and SLC. Figuring most of our time in the outdoors will be in the mountains above it. We love Snowbasin as well, which is how we found the area. I guess as far as options, it depends what you’re looking for. We’re very happy having less crowds and better access of Ogden. I guess time will tell though.